What is the connection between the construction of the Tabernacle, its furnishings and the Presence of G-d among the people of Israel? This week’s Torah portion, Parashat Terumah, centers on the instructions concerning the building of the Mishkan (the Tabernacle) and its furnishings. This raises an interesting question. For if the Bible’s overall theme is about G-d’s relationship with humanity through the Jewish people, then why is so much attention given to the details of objects? The answer is deeply connected to the purpose of the Mishkan, its services, and the manifest presence of the Divine. The Torah states, “They shall make for me a Sanctuary, so that I may dwell among them (25:8).” The Hebrew name for the Tabernacle is mishkan, which means “to dwell” or “dwelling.” As such, even the word mishkan denotes HaShem’s presence that would dwell among the people of Israel. Ibn Ezra comments that “while Moses was still on Mt. Sinai, G-d commanded him concerning the tabernacle so that it would be a permanent place among the people for the glory that had rested on the mountain.” Further, Rabbi Samson R. Hirsch notes that the key to the Tabernacle is directly related to Israel’s calling in verse 8. The Sanctuary represents Israel’s obligation to sanctify itself in its personal life. When the nation carries out that primary responsibility, G-d responds by dwelling among them. G-d has always desired to tabernacle among His people. And the purpose of the Mishkan was to be a constant reminder of G-d’s presence residing among the Jewish people. 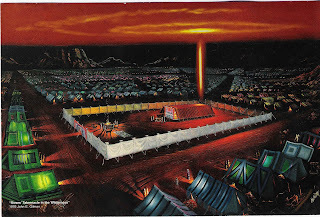 The mishkan represents G-d’s shechinah (from the same word as mishkan) – G-d’s manifest presence on earth. This promise echoes passages from the Torah in which G-d promises that He will be Israel’s G-d, and that they shall be His people. This promise of Israel’s unique relationship will continue into the Olam HaBa – the World to Come. May we, as followers of Yeshua, our Righteous Messiah, continue to live personal lives aware of G-d’s manifest presence, and may we continue to work to bring that Presence to the rest of the world – thereby affirming our calling to be a Light to the Nations. This entry was posted in Uncategorized and tagged Bible, Pieces of Parasha, torah. Bookmark the permalink. Today God dwells (tabernacles) in the believer’s body (I Corinthians 6:19) ! !